Understand the Russian dating culture and win her heart! It is true that dating a Moscow woman can be daunting. If you want to win the heart of a Moscow woman, it is necessary to understand what dating is in Russian culture. In Russian dating, bringing a present is a must. It doesn't need to be costly, and you do not need an occasion to do so. The most popular gift is a bunch of flowers. The number of stems, however, should be an odd number; even number of stems is for funerals. You can also bring chocolates along with it. If you are on a date and she arrives late, do not worry. That is normal for a Russian woman. That means she had been preparing for that date, which will take a lot of time. Some even arrive later than fifteen minutes. Be a gentleman. Open doors for her. Carry her baggage. Take her to her home. Simple gestures like these can tug at her heartstrings. Show her your sincerity. Call her often. Leave her simple love notes. Make her feel like you always think of her and you are in it for the long haul. Russian women are serious about everything, and they will expect you to treat them the same. Kissing, even just on the cheek, is a deal breaker. Worse if you talk about intimacy, especially on the first date. Russian women are traditional women, so do not be in a rush. Refrain from talking about politics, sports, and religion. Show your interest in Russian culture and history. You can also exchange thoughts about their music, art, and literature. You should know Russian women are proud of their culture, so being knowledgeable about Russia is a great way to win her heart. Appreciate her more often. When Russian women reach the age of 21 and are still single, they will feel bad. If they are still unmarried at the age of 27, they will feel miserable. If you date a Russian woman in her 20s, let her know that you do not mind no matter how old she is. Get to know her. Show her that there is more to her than just age. A Russian woman's family is part of everything she does. Never question her closeness with them because this is the center of her world. If you plan on marrying a Moscow woman, do your best to win her family's approval. Show them that you admire Russian culture and traditions and make her feel that you want to be part of this. Moscow women do not cajole. They will talk to you and get to know you if they find you interesting. And if they do not, they will save you the trouble and tell you right away. Despite this, a Moscow woman dreams of a great love story. When they're in a relationship, they aim for it to last for long. She wants a man who can raise a family with her. If you are looking for Russian women for marriage, there is a great chance you will find her in Moscow. In summer, you can do more outdoors. Since Moscow has a lot of parks, you have a lot of options. You can rent a bike, which is very convenient in Moscow, and go cycling with your sweetheart. You can stop by Tsaritsyno, a scenic spot where you can find the only example of Russian Gothic in Europe—the residence of Catherine the Great. Russian dating can also happen in unusual places, like the VDNKh, which was built to exhibit Soviet achievements. It is a one-stop location for getting in touch with Russia's history since a lot of museums have been built there. During winter, the middle area turns into a huge ice-skating rink (the biggest in Moscow). Lenin's mausoleum, where you can find Lenin's corpse, is also a truly unique yet budget-friendly date idea. 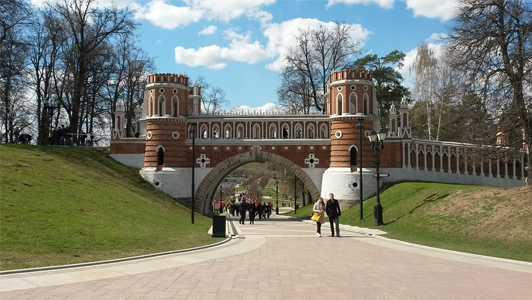 Gorky Park is the liveliest park in Moscow. It never runs out of activities. If you are visiting it from May to September, you should join the dance classes. It will be a fun way for you and your significant other to get to know each other and to learn salsa or lindy hop! You can also relax and be one with nature in the forest of Sokolniki. You can bring your picnic basket, and just spend an afternoon with your Russian woman. Also, the park is just a walk away from the train station, so transportation will not be a problem. If you enjoy people-watching while drinking some beer, you can both enjoy the night in Myasnitskaya. The picturesque place will make you feel like you are in a fairy tale. Keep the magical feeling going by visiting the Central Children's Store. Loosen up with Nutcrackers, Lego sculptures, and puppet performances. Feeling rebellious? Be crazy in an anti-cafe, which is an excellent Russian concept. Consume different teas, coffees, and cookies, and enjoy playing the piano or board games together. What's great is that you only need to pay for the time you spent there! What are you waiting for? Sign up now to start looking for your Moscow sweetheart and get lost in Moscow's magnificence!